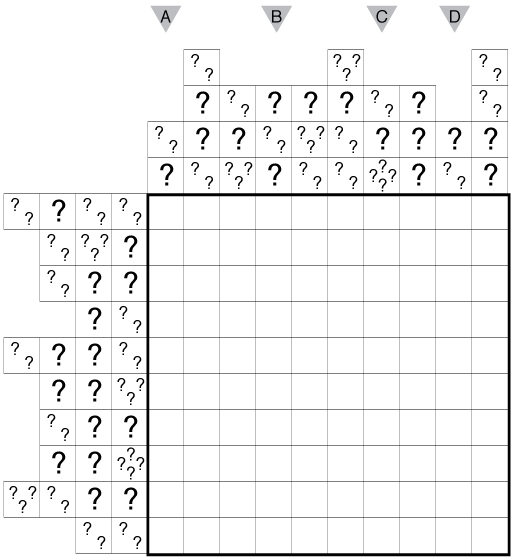 Author/Opus: This is the 95th puzzle from our contributing puzzlemaster Murat Can Tonta. Rules: Standard Tapa rules. Also, numbers outside the grid show the number of separate wall segments visible in that direction. A segment of length N in a given direction is taken as a building of height N. Buildings of height N block the view of all buildings behind them of equal or lesser height. Author/Opus: This is the 84th puzzle from our contributing puzzlemaster Murat Can Tonta. Rules: Variation of Tapa Rules. Every given clue is lying in two ways: first, the number of given clues in that cell is false; second, the value of any given clues is not true for any part of the Tapa around that cell. For example, a 3 clue could actually indicate 24, but it could not indicate 2 (same number of clues) or 23 (the digit 3 appears). 0 is not a valid clue for this Tapa. 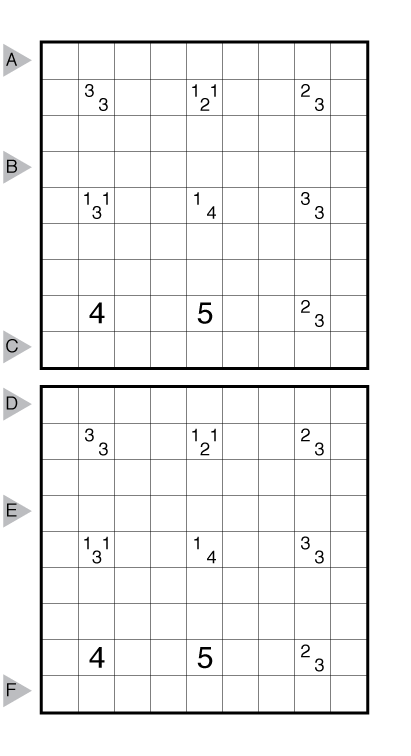 Author/Opus: This is the 303rd puzzle from Thomas Snyder, aka Dr. Sudoku. Rules: Variation of Tapa. All the cells in the Tapa must form a single closed loop without any crossings or intersections. Answer String: Enter the length in cells of each of the shaded segments (Not the loop segments!) from left to right for the marked rows, starting at the top. Separate each row’s entry from the next with a comma. 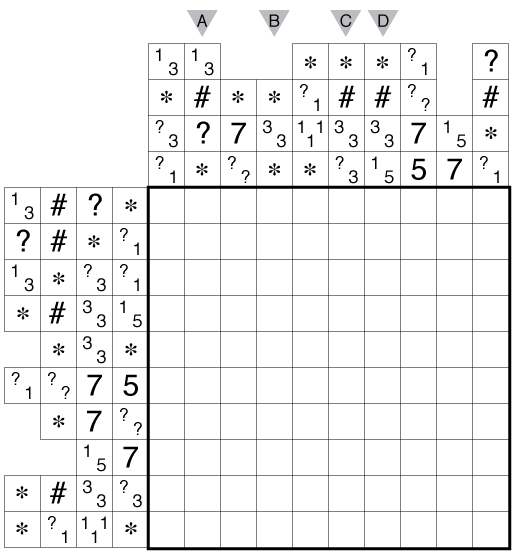 Author/Opus: This is the 157th puzzle from our contributing puzzlemaster Prasanna Seshadri. Rules: Variation of Tapa. 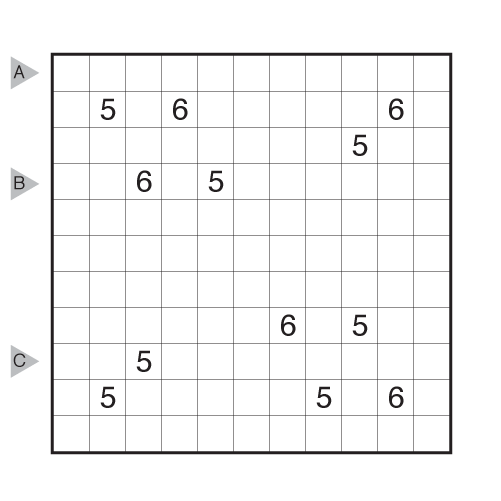 There are two grids to solve simultaneously; each number clue must have a different arrangement of shaded cells in its eight neighboring cells from its counterpart clue in the other grid. Author/Opus: This is the 8th puzzle from guest contributor Chris Green. Shade some empty cells black to create a single group of black cells that are all connected to each other through their edges. 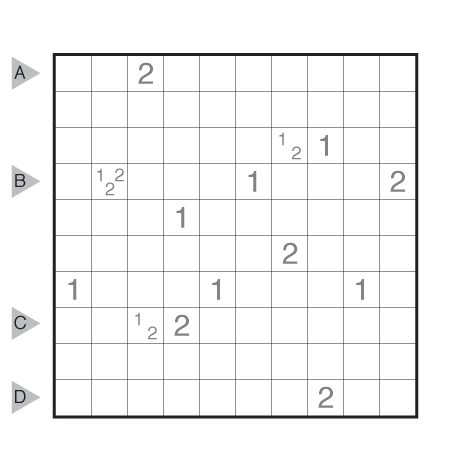 No 2×2 cell area within the grid contains all black cells. 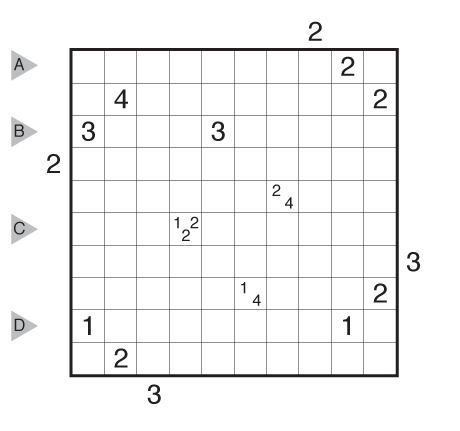 Numbers and symbols to the left/top of the grid represent all unshaded cells in the grid in that row/column in order, either from left to right or from top to bottom. 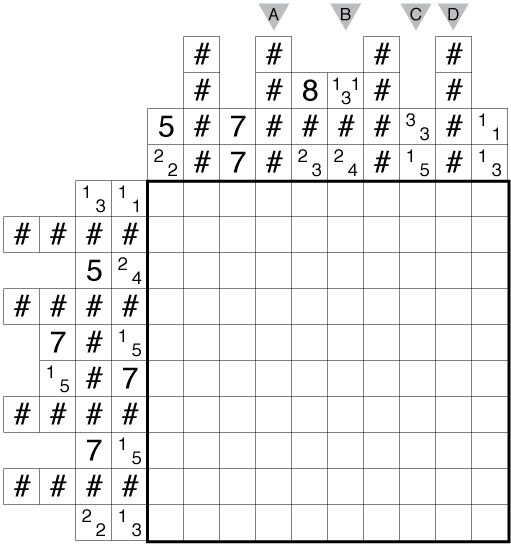 The numbers and symbols represent the value of Tapa-style clues inside the grid, specifically the length of consecutive shaded blocks in the neighboring cells. If there is more than one number in a cell, then there must be at least one white (unshaded) cell between shaded groups. The three symbols indicate different kinds of missing information. – A question mark (?) represents a single missing positive integer as part of a clue (either alone or in combination with other numbers/question marks). – An octothorpe (#) represents a single white clue cell which may have any combination of values including a single number or multiple numbers. – An asterisk (*) represents an unknown number of white clue cells, including one, multiple, or no clue cells at all. Any clue cells indicated by an asterisk can have any combination of values including a single number or multiple numbers. Answer String: Enter the length in cells of each of the black segments from top to bottom for the marked columns, going in order from A to B to C to D and separating each entry with a comma. Time Standards (highlight to view): Grandmaster = 7:00, Master = 12:00, Expert = 24:00. Note: Follow this link for other Cross the Streams and this link for other Tapa. Author/Opus: This is the 7th puzzle from guest contributor Chris Green. Time Standards (highlight to view): Grandmaster = 7:30, Master = 9:30, Expert = 19:00. Author/Opus: This is the 6th puzzle from guest contributor Chris Green. Time Standards (highlight to view): Grandmaster = 4:30, Master = 6:30, Expert = 13:00.